Home / Life at the Manor / We can never paint that door frame again. Last night while waiting for the arrival of the Best Mother Ever, I got the bright idea to definitively measure dogs by pinning them up against the door frame between kitchen and living room and marking their heights with a pencil (first we wanted to use our front one got from Uk Oak Doors… but it’s just too great to be marked). This could have gone more smoothly. Zille came right to me, stood in place, and let herself be measured. So did Sid. So did Beowulf. Tink on the other hand first tried hunching her back to make herself taller, and then when I sighed and begged her to behave, she extended her front legs and made herself shorter. 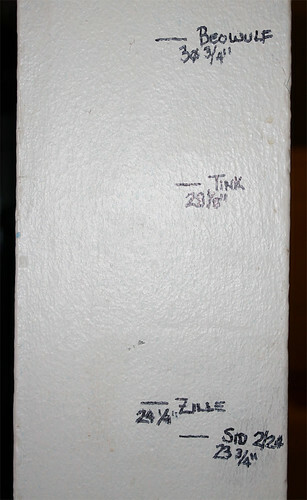 A few moments of wrestling my recalcitrant dog later, I had my pencil marks and got out the tape measure and recorded their heights on the wall. I was so pleased with the result that I went over them with a Sharpie to immortalize them. Sid’s is the only one with a date, because Sid is still growing. I figure I’ll measure him once a month or so and keep track of his continued progress. Quick Hit: Sometimes I write socially responsible things.